In an effort to make amends after the Cambridge Analytica privacy scandal caused a massive breach of public trust, Facebook announced a new feature on Tuesday that lets users clear their browsing histories on the platform. Aptly dubbed "Clear History," the tool is similar to what's built into your internet browser. 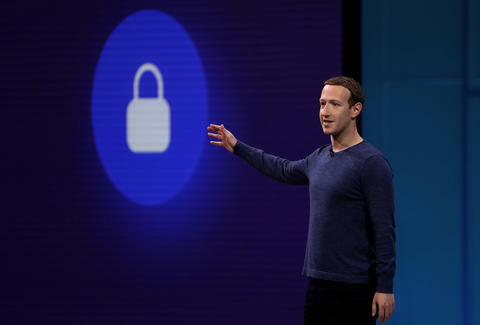 Writing in a post published ahead of the company's annual F8 developer conference, CEO Mark Zuckerberg explained the new feature: "In your web browser, you have a simple way to clear your cookies and history. The idea is a lot of sites need cookies to work, but you should still be able to flush your history whenever you want. We're building a version of this for Facebook too." The idea, Zuckerberg wrote, is to give users the ability to wipe their interactions with apps and websites that use Facebook's ad network and analytics tools. "Once we roll out this update, you'll be able to see information about the apps and websites you've interacted with, and you'll be able to clear this information from your account," he wrote. "You'll even be able to turn off having this information stored with your account." The update won't be available for "a few months," per Zuckerberg's post, and the CEO stressed that using Clear History could give Facebook a less than optimal user experience because you'll likely have to continuously remind the website of your preferences. "To be clear, when you clear your cookies in your browser, it can make parts of your experience worse. You may have to sign back in to every website, and you may have to reconfigure things. The same will be true here," he said. "Your Facebook won't be as good while it relearns your preferences." The introduction of Clear History comes over a month after the company faced a firestorm of criticism during the Cambridge Analytica data-mining scandal in which the profile information of an estimated 87 million users was shared without their consent. Since then, the besieged CEO was grilled by Congress relating to the company's mishandling of user data and has made numerous overtures about Facebook's dedication to preserving user privacy. Clear History is the latest attempt the social network has made to salvage public trust and to increase transparency.